Greetings all, I've been researching the ADW, having concluded my research on Lepanto and the Spanish Armada, but one thing I'm struggling to find information on is the ratio of drake guns to regular guns on Dutch warships. I found some decent sources of English ships, and can extrapolate from there for the rest of the English ships, but I've yet to find a single source on Dutch ships of the period. From the English example I've found, it seems like all the broadside guns were Drakes, while the bow and stern chasers were regular long / heavy guns. Anyone know of any good sources on specific positions of Dutch guns during this period? Check out James Bender's "Dutch Warships in the Age of Sail, 1600-1714: Design, Construction, Careers, and Fates", ISBN 978-1848321571. He is an expert on the Dutch during this period. He is an FB and other social sites. Isn't a "Drake" an English term for a specific size of cannon? All the sources I have seen on the ADW have guns listed by weight. The Osprey on the Warships of the ADW lists number of guns by weight for example. Of course even then there are discrepancies! Similarly rules I have seen for the ADW use weight measures for broadside firepower rather than relying on the English naming conventions. The term 'Drake' was usually used for a less powerful version of a gun, particularly one of larger calibre. By the dates mentioned it meant a shorter gun but earlier a gun with thinner walls (and so only able to use a lower powder charge) would also have been covered by the term. Large calibre guns on land were often longer than naval versions. Used as siege guns in small numbers they were not limited in the distance they could recoil, naval guns were. Having a long gun was thought to improve both range (which it did, up to a point) and accuracy (which it didn't). Broadside guns were not thought to need long range, weight of shot was considered more important, so shorter, bigger guns were preferred. The concept re-appears in the Carronade once iron replaced bronze for naval guns. I was pretty sure that the Dutch used drakes, if not the specific term, then at least the kind of cannon. This image is from the Osprey on Dutch navies of the 80 years war and lists drakes, which are also mentioned in the text as being popular in all calibers (although perhaps this had changed by 1652?). I'm using the threedecks forum for most of my information on the weapons of dutch warships of the period, but it doesn't list drakes in either then English or Dutch ships, just the shot weight for dutch ships and the specific cannon names for English ships. There is a digit missing from some of the figures in the last column. 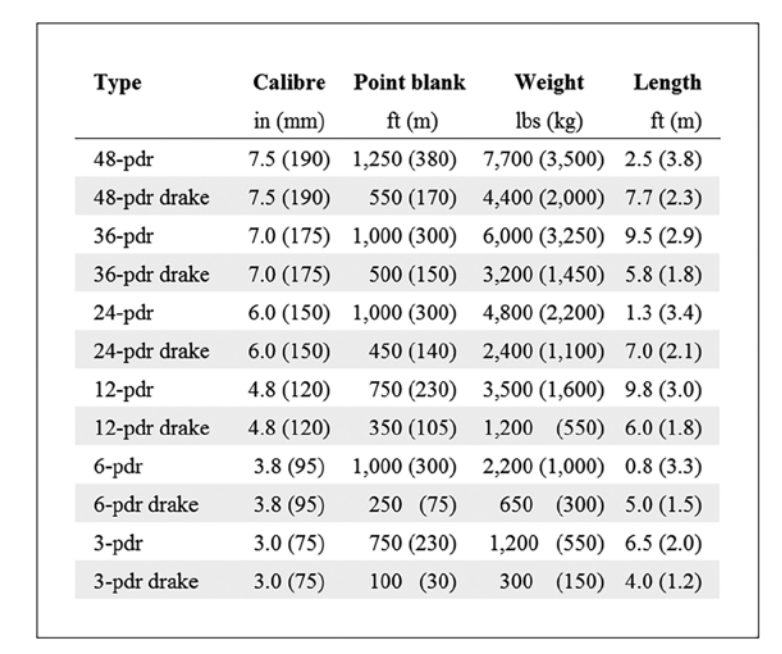 The top entry should read 12.5 ft / 3.8 m.
The large difference between point blank ranges indicate that these are comparing Drakes with thin walls against full strength & length guns, particularly in the smaller calibres.